Hi - Clearly. those two photos are from different locations. Based on a photo at the Traverse City History Center web site, I would like to suggest that only the top photo (of an empty stage) is from Steinberg's Opera House. - Tom. 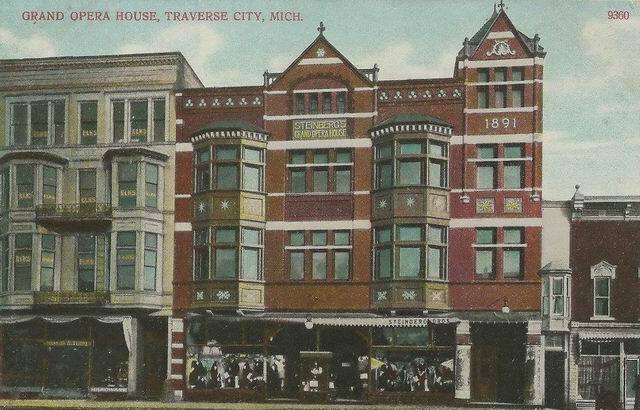 Steinberg's Opera House (and Steinberg's retail store on the ground level of the building) was at 227-231 E. Front Street in Traverse City. It is _not_ to be confused with the recently restored City Opera House on the south side of Front Street about two blocks west. _Many_ web sites mix them up, but they are two separate venues. - Tom (lived in Traverse City for about 10 years). I have found just a little info on this Opera House. I have discovered that it opened on December 11th 1894 and it''s first show was Hamlet Starring Walter Whiteside. So far this is all i have found but hope it helps.